Shamorie Ponds with the game-winning layup. @StJohnsBball. The St. John's Red Storm stunned Marquette, the 10th-ranked team in the nation, 70-69, on Tuesday night, giving them two big victories on this three-game road trip. This brings the Red Storm's Big East record back to .500 at 5-5, as they return to Madison Square Garden on Saturday at noon for a matchup with Providence. They then host Butler at Carnesecca Arena on Tuesday night at 8:30 p.m., and then face defending national champion Villanova on Sunday, February 17 at 5:00 p.m. at The Garden. 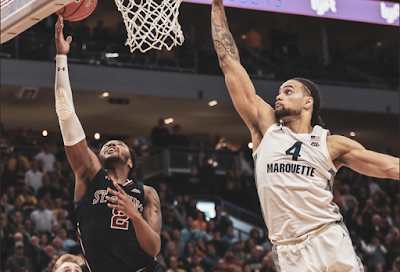 This was the second time St. John's has beaten Marquette this season, as they beat them soundly on New Year's Day at The Lou and handed them their first loss at Fiserv Forum. Shamorie Ponds led the way with 28 points, and he had the game-winner on a layup with 20 seconds left. Ponds shot 9-19 from the field, including 1-5 o three-pointers, with 7 rebounds and 2 assists. St. John's led this one throughout, and went up by as many as 15 points when Ponds made a layup to make it 49-34 with 15:45 remaining. Marquette would not go quietly, as they responded with a 12-2 run, and then pulled within a point, at 56-55, when Sam Hauser drained a three with 5:56 remaining. Later on, there was a stretch in which Ponds made five straight free throws to give St. John's a 68-63 lead with just 1:24 remaining. Marquette came right back, as Hauser got a quick three-pointer, followed by another one of Sacar Anim to give them a 69-68 lead with 36 seconds left. Ponds responded with his layup with 20 seconds left to make it 70-69, and then the Red Storm defense got a big stop, as Markus Howard missed a jumper with 7 seconds remaining. St. John's also got big contributions from Justin Simon had 19 points on a superb 8-11 shooting, with 6 rebounds and 3 assists; and Mustapha Heron had 10 points (3-8 FG, 3-5 threes), with 4 rebounds and an assist. St. John's defense was superb throughout, as they held Marquette to just 40.7 percent (22-54) shooting. They kept Markus Howard (like Ponds, a Big East Player of the Year candidate) in check, holding him to 17 points on 5-17 shooting, including 4-8 on threes, with 5 rebounds and 5 assists. Sam Hauser led the way for Maquette with 19 points, but shot just 6-16 from the field and 3-12 on three-pointers, with 11 rebounds to give him a double-double. His brother Joey was held to just 4 points and did not make a basket, as he shot 0-3 from the field, with two misses from behind the arc. St. John's Head Coach Chris Mullin said of defeating Marquette twice, “I think our defense against Markus Howard and the Hauser brothers is the focal point. We’ve got some length and guys that can move their feet, so I think the switching helps but you still have to guard them. Howard can get free and get 40 in a half. The Hauser brothers, if you give them an inch, they’ll make shots.